The primary function of a creation scientist is to investigate the nature of our world from the intelligent design perspective. We must theorize from our unique point of view if the truth is to be understood. Given the effect of the theory of evolution on people's ability to believe in God, evolutionary biology is probably the most important topic for a creationist to study. It is only with the absolute truth that we can effectively counter secular mis-information, and the facts will only be determined following adequate development of ID evolutionary biology theory. Creationary evolution may indeed be the field of science requiring the greatest amount of attention today. Creation / Evolution: Does it Matter What we Believe? Evolution is an atheistic theory that attempts to explain the presence of life on earth without God. Scientists assert that the earth developed through purely natural processes following a great cosmic explosion called the big-bang. They believe that living microbes simply developed following a series of random reactions within a spontaneous aggregate of molecules. Furthermore, the theory of evolution teaches that all organisms on earth are related to the same common ancestor. This perspective is a striking contrast to the Biblical version of creation, which teaches that God created the universe and many kinds of plants and animals on earth during a period of time equivalent to 6 of our days. In addition, the Bible clearly states that God created humans distinct from the animals during that same period of time. 1 Corinthians 15:39 - For not all flesh is alike, but there is one kind for men, another for animals, another for birds, and another for fish. It is certain that life on earth evolves. However, according to the Bible life began evolving after the creation of the many kinds necessary to support life on earth. God apparently created all organisms on earth with the ability to evolve through systematic self genetic engineering. 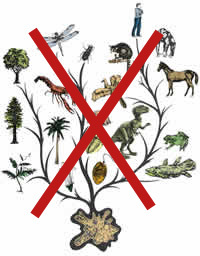 It is true that plants and animals are constantly changing, and new species are developing all the time, but there are distinct animal types alive today and in the fossil record, and few transitional forms exist to support the claims that all creatures have evolved from a common ancestor as the evolutionists propose. In addition, the animals found in the fossil record are typically identical to those found alive today. The Bible refers to many kinds of animals. These Biblical "kinds" are probably most synonymous with the Family level of scientific classification; such as canine, feline and bovine. Following their release from the ark, these various kinds of animals evolved into all the various species we see alive today. Although organisms are classified based on similarities and differences of characteristics, evolutionary perspectives have influenced the groupings of organisms due to presupposed relationships. Therefore, the Family level can not be held as an absolute definition of the "kinds" of animals God created. It would appear certain that in some instances other groups such as the Genus or Order may represent the Biblical kinds. Generally speaking however, all the species within each mammalian Families could have evolved from only a reintroduced pair following the flood. All organisms were created with the ability to adapt to a wide variety of ecological conditions. However, we are being taught that random mutations, (such as copying errors and genomic changes induced by external mutagens), are responsible for evolution of species on earth today, and this is simply untrue. Evolution occurs by design through internally performed cellular reactions. Geneticists have known for decades that offspring variability was the result of homologous crossing-over reactions that occur during the division of cells used for sexual reproduction (meiosis). Prior to dividing, the DNA within the cell condenses and rearranges itself. These recombination reactions are still almost completely uncharacterized, nor are we yet able to subsequently determine what specific changes were made. The differences among children from the same parents, or between various breeds of animals are not due to mutations. It is a matter of historic fact that the domestic breeds were created through a succession of genetic recombination and artificial selection. All the dog breeds were bred from the wolf and progeny by humans. Physically unique populations in nature are created in the same way. Evolution likewise occurs through a history of recombination and natural selection. Externally induced mutations or copying errors may induce some genomic change, but they are simply insignificant in comparison to the rearrangements being performed by the cell during meiosis. These reactions are specifically produced to introduce offspring variability and thereby drive evolution. Meiotic recombination is the principal source of genetic alterations that creates offspring variability, and yet we are being erroneously taught that evolution is the result of random mutation. Recombination events (crossing over and independent assortment of homologues) are responsible for the variations of characteristics possessed by offspring from the same parent. These differences can have advantages or disadvantages in various regions and therefore provide differing chances of survival. For selection to be effective in transforming the population into a more beneficial form, the selected characteristic must be passed to future offspring at a higher frequency. This occurs because inbreeding any feature will transform the species into a pure breed for the selected trait. Selection for a particular trait creates a genetically homozygote population or pure breed. A pure breed can be easily generated by inbreeding a desired feature and testing the offspring for their ability sire progeny with variability. When a trait is selected or inbred, alternative genes are eliminated, and the result is a genetically limited organism. 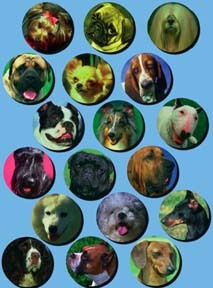 The establishment of pure breeds has been well documented by breeders of all kinds. It is clear that all sexually reproducing organisms possess the ability to produce offspring possessing variable forms, and selection removes genes from the population. The success of any kind is greatly enhanced by speciation, or the formation of an isolated subpopulation. The physical separation enables the new group to become unique during the adaptation to a different niche or habitat. Evolution is the process of specializing to specific conditions. Adaptive specialization greatly improves the immediate survival potential of the species, but it also makes them more prone to complete extinction if conditions change. Therefore, speciation allows subgroups each to specialize independently giving the kind greater survivability as well. A species is a of naturally occurring breeding group which are reproductively isolated from other such groups. Many separate "species" can interbreed in captive situations, but in nature have developed color distinctions, mating calls or gestures which allows them to distinguish their group from another and they remain reproductively isolated. When a group of animals remains isolated; natural selection and genetic recombination events alter the genome of the population independent of other species. If the genomic changes are significant, the homologues possessed by two related can become unable to pair and crossover during the first mitotic division following fertilization, and the groups are thereby reproductively incompatible. If any two groups are isolated and kept from interbreeding for 40 generations, they will become second generation sterile. For instance, the donkey and the horse can interbreed and their offspring, the mule is sterile. If the two groups are isolated for 100 generations, they will become first generation sterile and will not be able to interbreed with each other. Therefore, two animals could be progeny from the same Biblical "kind" even if they cannot currently interbreed. The variations of characteristics isolated from domesticated animals by professional breeders provides us with the minimum quantity of evolutionary potential these organisms possess. These various breeds of animals are not mutants, nor are the variation of species found in nature such as the finches. The scientific community is now almost totally atheistic, and is refusing to accept the intentional production of genetic variability which is being produced by the cell through homologous recombination. They believe that life has originated and is evolving through random mechanisms, which are not reliant upon living systems, and mutations are therefore a theoretic necessity. Geneticists have conclusively proven that the changes selected during classic breeding are the result of cellular reactions, but evolutionists are teaching that any variation in nature is the result of random mutations. Do not be misled. Evolution occurs by design, and began following the creation of the many kinds of organisms required to sustain life on earth. Microevolution - Adaptive change that occurs within a population including speciation. Macroevolution - The evolution of higher taxa. The long-term history of an organism's speciations, adaptations, and extinctions leads to the formation of taxonomic groups above the species level. Species - A natural population, that is reproductively isolated from other such groups. Mutation - A change in genetic material resulting from errors during replication, recombination, or exposures to mutagens. Mutations can be beneficial, harmful or neutral. Recombination - A intentional change in genetic material produced by cellular machinery. Recombinants can be beneficial, harmful, or neutral, and are largely responsible for offspring variability leading to evolution.